Long zoom, a fast-handling design, built-in Wi-Fi® and Near Field Communication technology (NFC)**, all come together in the COOLPIX L840 to help you take your photos and videos to the next level. Zoom in and catch a great close-up, then send your image directly to your compatible smartphone to share the photo before the night is even over. Flip out the high-resolution tilting LCD screen, take a low-angle macro shot of a delicious meal and post it online before you even take your first bite. And forget about blurry photos and shaky videos—the COOLPIX L840's compact grip-style design and Vibration Reduction (VR) helps keep your photos sharp and your videos steady, even in low light. Start sharing extraordinary views of your extraordinary life. Zoom in with the power of a 38x optical zoom telephoto NIKKOR glass lens and capture beautiful close-ups of faraway action. For added reach, zoom farther with the 76x Dynamic Fine Zoom, an enhanced digital zoom function that effectively doubles your reach. If you lose your subject while zoomed in, press the Snap-Back Zoom button for a quick zoomed out view. Find your subject again and release the button—the COOLPIX L840 will zoom right back in. A comfortable grip makes it easy to hold the COOLPIX L840 steady, but Vibration Reduction (VR) takes care of even the smallest camera shake for sharper photos and steadier videos. Quickly and easily send photos wirelessly from your Wi-Fi & NFC enabled COOLPIX L840 to a compatible smartphone or tablet±. Share your great photos on the go, even in remote locations, or use a smartphone or tablet to control your camera. 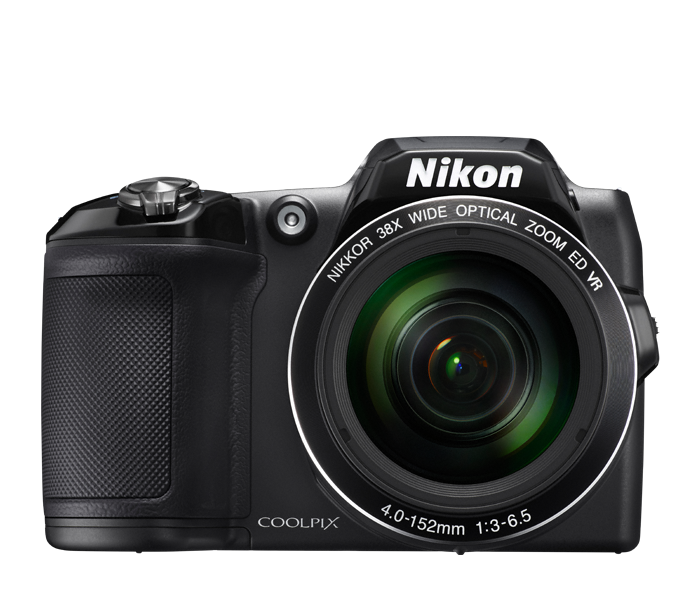 The COOLPIX L840's large, 921,000 LCD display makes it easy to compose your shots or monitor your video recording. Reviewing and sharing your creations is a pleasure, too—every shot looks fantastic on the display. The COOLPIX L840 is so easy to use, anyone can take great photos and videos with it. Just turn the camera on, point, shoot and marvel at the results. For maximum point-and-shoot convenience, select Scene Auto Selector. It automatically optimizes the camera settings for each shot, no matter how challenging the situation. You'll be free to enjoy the moment while you capture it. If you want a compact camera that shoots stunning Full HD videos, the COOLPIX L840 delivers. Full HD 1080p means exceptional video quality. Record the action, then connect to an HDTV* and watch your videos come alive. A built-in mic records high-quality audio in stereo. Your videos will look and sound phenomenal. Lens shift Vibration Reduction keeps the shot steadier, even if your hands are not. Say goodbye to blurry photos, shaky videos and tripods. Easily match your situation to one of 19 Scene Modes like Beach, Snow, Night Portrait, Sunset and more, and enjoy effortless great shots. Or, choose Scene Auto Selector and let the camera choose for you. It's frustrating when a smartphone camera focuses on the wrong thing. With COOLPIX L840, Target Finding AF quickly determines your intended subject and puts the focus where it belongs—on your subject. Based on Camera and Imaging Products Association (CIPA) standards for measuring the life of camera batteries. Measured at 23(-/+2)°C (73(-/+4)°F); zoom adjusted with each shot, flash fired with every other shot, image quality set to Normal, image size set to 4608 × 3456 (16.0MP). Battery life may vary depending on shooting interval and length of time menus and images are displayed.